In our fast moving times five years of sharing a musical path is a remarkable way and a good moment to celebrate. 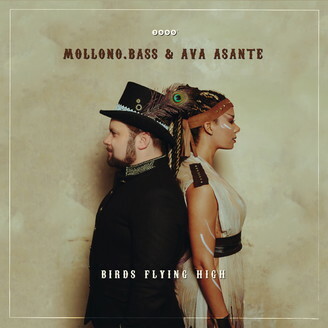 Mollono.Bass & AVA Asante celebrate with their first joint album: BIRDS FLYING HIGH. By combining the catchiness of their solid grooves with a touching violin and a breathtaking voice they create a magical journey - a journey that takes you along endless roads from lively african villages to mystic asian dreams. While part one of their vinyl double brought pleasure to the festival world in summer ’16 already, the silence of winter gave more of their precious time in the studio to melt all their musical feelings into the second vinyl - and spring finally combines new mixes of all tracks on the album CD. Lay back and relax or move your feet in passion.